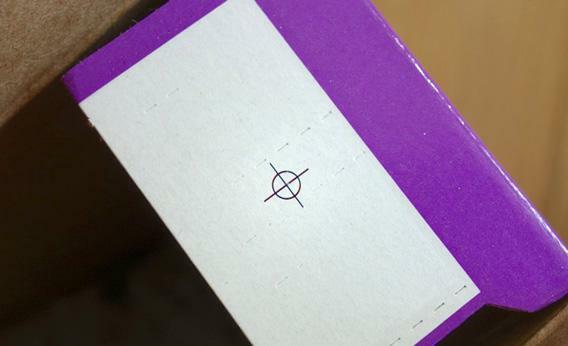 Color spots on packages: what are those things? A cereal box. See the boxes of various colors in a row near the bottom. What are those things? Our latest effort to dispel the mysteries of the modern visual landscape finds us in the supermarket. For previous columns, click here; to submit your own suggestions, e-mail us. 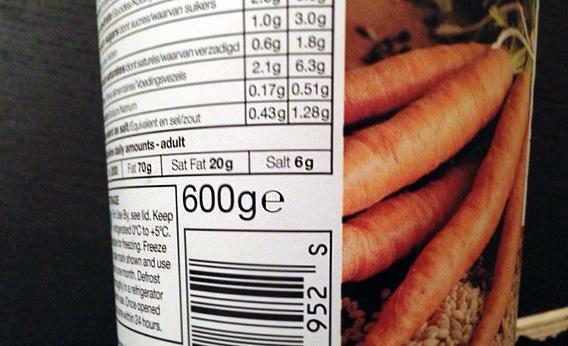 There are lots of good reasons to take a closer look at food packaging. You might be trying to lose weight or to eat more healthily (the first and fourth most commonly broken New Year’s resolutions, apparently). You might wish to avoid eating “anything with more than five ingredients, or ingredients you can’t pronounce,” as Michael Pollan has suggested. You might be scouring food packages—in vain, so far—for Mark Bittman’s dream food label. Or maybe you just want to check that your Twinkies—which may or may not be graced with eternal life—are still fresh. a) The pattern is called a chromatic bar code (CBC). In many countries, supermarket scanners use color bar codes, which can be read more reliably than the black-and-white sort we use in the U.S. Products sold with the same packaging in the U.S. and these countries will have both a CBC and a black-and-white bar code. b) The blobs of colors are known as printer’s color blocks or process control patches. They’re used to help control the quality of individual colors used by a printer, so that the tints and hues are correct and consistent. c) The pattern is called a printed grab block. In automated packing systems, which use machines to package your food, the grab block makes it easier for such machines to correctly maneuver and align the packaging as it is manufactured and shipped. d) It’s called a printed heat date (PHD). The ink used for the brighter colors fades over time. When there’s no difference between the bright and faded colors, then supermarkets will generally consider the food to be expired, regardless of the printed expiration date. The color blocks are essentially a tool used to understand how a printer is printing at any moment in time to ensure consistency. The blocks provide very technical information about printing conditions that allow printers to quickly adjust. For example, if something looks too red, the color blocks can help to determine if it’s the Yellow that is too weak or if it’s the Magenta that is too heavy. This keeps printing quality high. Both man and machine usually check these color splotches. According to Dillon Mooney, technical consultant for Printing Industries of America, “Modern presses have automated the process, but the operator typically makes the final adjustments.” The colors that appear most often are the “process colors” black, cyan, magenta, and yellow. As my diabolical Hewlett Packard printer has on rare occasions proven, these colors can be combined into many other colors. Why do some packages not have any color patches? It’s just a printer/client preference, says Christenson. 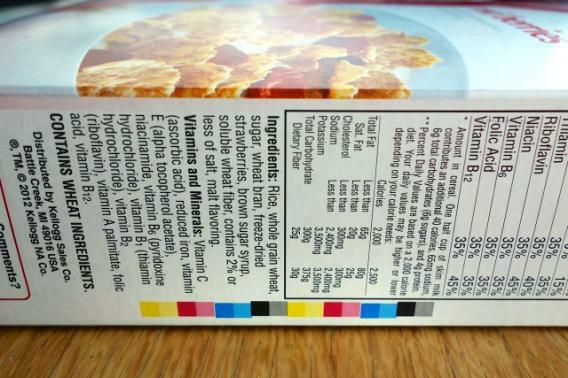 But keep in mind that colors might have been on a printed portion of the package that was later trimmed off. While puzzling over these packaging perplexities, I decided to look into a few more. 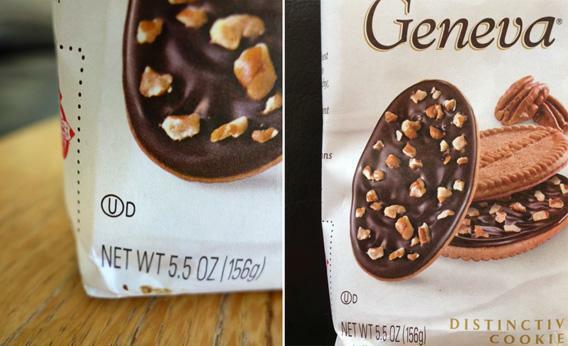 First, the “U” in a circle, followed by a “D,” which you can see here courtesy of Pepperidge Farm Genevas (though cookie-wise I’m more a man from Nantucket…). “OU” stands for Orthodox Union, a Kosher certification. The “D” that follows indicates that the product contains dairy. You can find full descriptions of various Kosher certification marks—and the individual letters that may follow them—online. There are also Halal marks, though in America these are much less common. Finally, let’s look at the “e” that is found on most food packaging in the fabled, genetically-unmodified lands of Europe (and on many European products exported to the U.S.) If you have no idea what it means, don’t feel bad—neither do most Europeans. In an informal survey of about two dozen European friends and family, none had ever noticed this symbol, or had any idea what it meant. Asked to guess, they wondered if it meant that the number reflected the weight of the contents without the container included, or if it denoted something eco-friendly, or if it perhaps indicated that a product was legal for sale across the European Union. In fact, the e signifies that the product complies with European Union regulations on the accuracy of the weight or volume measurement on the package. So if a bottle says “500ml e,” then you know that the EU approves of how that 500ml claim is calculated. Also known as an e-mark or “estimated sign,” the e isn’t mandatory, but it acts as a “metrological passport” proving that a package more or less contains the quantity it claims. Of course, even the most Europhilic American might wonder about the usefulness of a symbol that 1) appears on nearly everything in a supermarket and 2) is a complete mystery to almost all consumers. Reading the relevant European Directives on the e-mark will not, I assure you, make such wondering cease. If you find yourself wondering about something in the cookie section of a Helsinki supermarket, or anywhere else, take a pic and send it along.